When Argos said they wanted to shout about the launch of Forza, the hotly-anticipated new supercar Xbox game set in London, we knew we’d need an idea to rev the engines of the gaming world. We put our racing caps on and thought if customers pre-ordered the game through the retailer, we should offer them a lift home from an Argos store in the very cars that featured in the game… just your average Tuesday afternoon at the shops right? 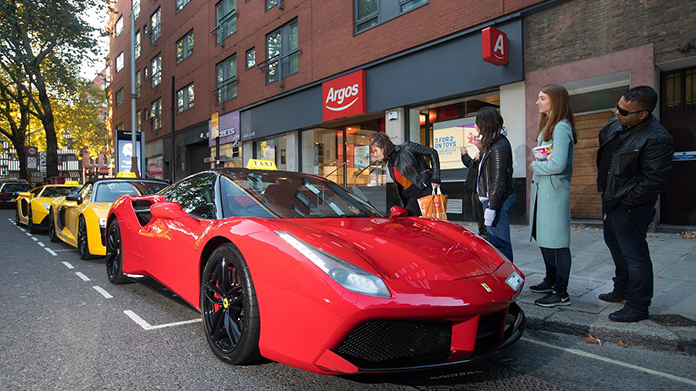 With everything from a Lamborghini Aventador to a Ferrari 488 at the ready in an Argos car-park we fuelled quite a bit of supercar excitement. The team hit the phones to let the London listings know when the Forza fleet that would be descending on a nearby store, landing stand out pieces in The Sun and Made in Shoreditch. We then took it up a gear with an early morning shoot of our Argos taxi’s at the ready outside a store, securing coverage across all the major gaming titles including Games Booth and Invision Community. The coverage accelerated (had to be done) from there with great pieces on The Mirror, Yahoo and Evening Express whilst the gaming Gods at Gamereactor called it ‘a spot-on stunt by Argos’. With coverage secured, games sold, and more than a few happy customers, Argos crossed the line in pole position.